If you’re just now hearing about Net Neutrality let me fill you in on the details. There is a lot at stake in this continuing battle including YOUR very own privacy, YOUR unfettered access to internet (on your computers, phones, and tvs), and the laws protecting you as a consumer and citizen. The phrase “net neutrality” can be a little bit long on the eyes. What it really boils down to is how much data can your internet service provider collects about you, and how can they legally squeeze you for maximum shareholder value? 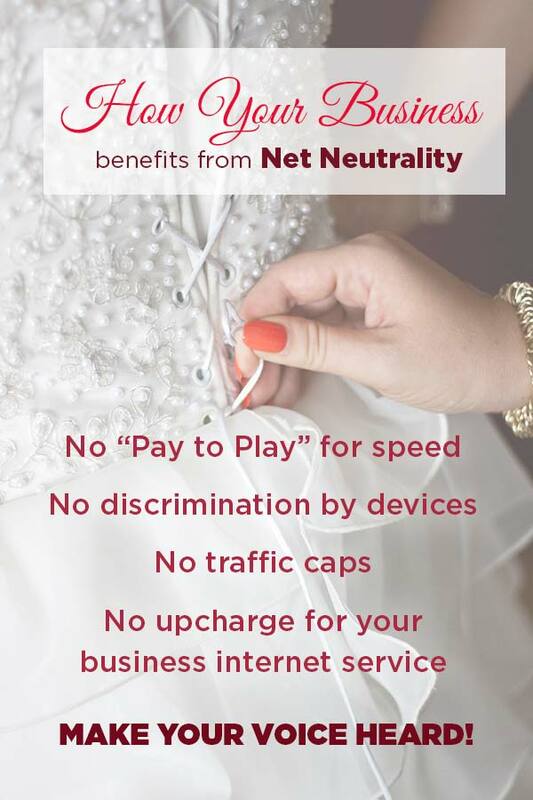 If you think the internet should be a level playing field, and a service that should be run to your home like a phone line or a water supply, then you are on the side of Net Neutrality. And you probably just want the wifi to work when you open your laptop so that you don’t have to think about all this political stuff. That’s what I want anyway, things to just invisibly work… Like electricity does. Can you imagine if your electricity company looked a your usage, tried to glean some data from it, and sold that information to other companies? They might think, Lauren’s usage goes up every Thursday night for forty five minutes. I bet she ran out of clothes to wear and is doing midnight laundry for Friday. Let’s pass this on to a business who can sell her a faster clothes dryer, or a takeaway laundry service. Suddenly I would be up to my eyeballs in doorhangers and direct mail. Wouldn’t that be crazy?! Though it might sound far fetched for a company who takes one measurement at any given time, your internet service actually has quite a lot of information about you already. As I wrote about in my disparagement of Senator Jeff Flake and his internet privacy policies, an important rule regarding what they can do with that information has been removed. Did you know that your ISP (Cox, Century Link, etc) knows what websites you are visiting, how regularly, for how long, etc? With the exception of VPN users, your ISP knows quite a lot about you actually. And they used to have to ask your consent before sharing that information with any other entity. But not anymore. Is your blood starting to boil yet? The politicians who try to erode net neutrality policies try to rile up their pro-business, pro-capitalist base when talking about reversing internet protections. If you are a person dedicated to a totally free market, then I suppose you would be against telling Big Telco what they can and cannot do. That’s not the United States we live in, though. We have busted trusts, punished monopolies, and capped the limit on how far businesses can go to prey on the poor or vulnerable. That’s not true free market capitalism running wild. You might say, let the ISPs do what they will. Well, one of the very first things they’ll do is boost their bottom line by looking at the top desired internet content and starting to charge more for that traffic. Today the biggest name is probably Netflix. So Netflix has to pay out large sums so that internet service providers continue to let them serve up video unthrottled. Or perhaps they will pass this charge onto you and I instead of Netflix. Why not if they are free to do so? If you’re the kind of person who is very okay with toll roads and pay toilets, in addition to big data mining every facet of your digital life for advertising potential, then you can stop reading. Actually why don’t you go read TechCrunch’s summary of arguments against net neutrality, and see what you think. On the other hand if you enjoy browsing everything at the same speed and having your consumer privacy protections maintained, you need to help America stay on top of this. 2017 is going to be a pivotal year…. We’ve been saying that for several years now, but the current administration is really keen to do something about it. Of course they are. There is a lot of money to be made from people like you and me. In an article on Medium author Tommy King writes about the business implications of Net Neutrality. Unfortunately, telecom joins only healthcare on the pantheon of industries least beholden to the rules of the free market. This is it in a nutshell. The barrier to entry in those industries will be raised (and it was already quite high), but the consumer protections would be preserved. It’s true! The regulations that keep data flowing to our homes and offices at the same rate we pay for actually helps business because there is so much opportunity. If you own a small business you can move mountains online, and even get good representation in search ranking pages. With brick and mortar operations the differences between the mom and pop stores are so much more stark. You can be a professional with equal footing online. Sure the giant corporations will outspend you and have vast catalogues, but your business can get out there and be credible. Customers can find you and be unencumbered as they watch your videos and see all of your offerings. That’s the power of unthrottled (which means not artificially restricted) connection. Business A has the same delivery advantages as Business B. Removing our consumer protections for internet access would set the stage for all kinds of “pay to play” advantages for businesses. The kind where both consumers and other companies get squeezed. What if you had to start paying Century Link a few grand every month to boost speeds to your site? That sounds like a racket to me. As always, call and write your congress people when issues are up for vote. Get even better advice from BattleForTheNet.com and Namecheap’s NetNeutrality.com. Don’t go down without a fight! Lauren Grey is the brains behind Scottsdale Web Design Company Sprise Media and a big believer in an open internet. She knows that business websites of all sizes benefit hugely from being served without restriction on the open web. If you’re looking to build a new website (or spruce up the one you already have) and you want a pro with laser-like attention to detail, she’s your gal. Reach out today for your free consultation and get a new direction in your sights!